Most of us have our concept of beautiful world based on how our favorite city and our favorite corner in it look like. Comes a time in everyone’s life, when one; at his or her own concealed comfort, think to embrace the beauty of the city that has explained the meaning of lively and livable world. The city that has its skyscrapers firmly based in green, ultra-modern infrastructure wrapped in lush and tranquil corner of one’s own at a decent height. However, when we think of Asian cities, not many can match the charisma of the Lion’s City. 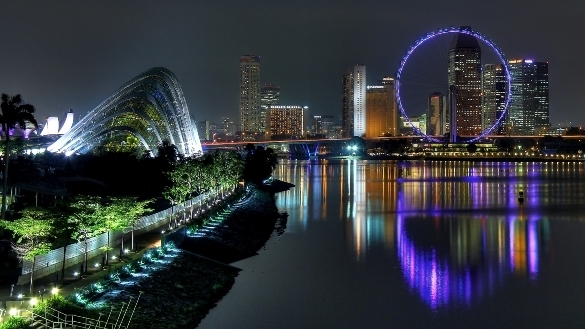 In may ways, Singapore stands apart with all the contemporary attributes of first world cities. The magnetism of the city inspires many to seize the majesty and sublimity of the city and treasure for the rest of the life in one corner of the heart. 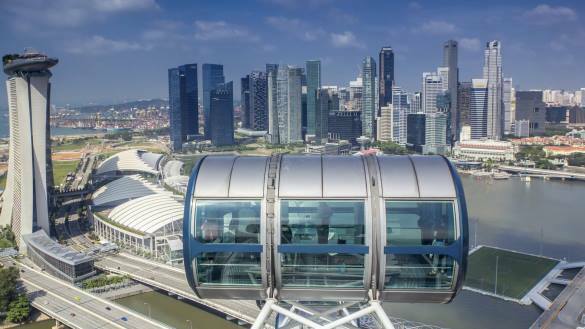 Visitors and residents alike have opportunity in Singapore to capture the unmitigated beauty of the city in a single moment of resplendency through Singapore Flyer. 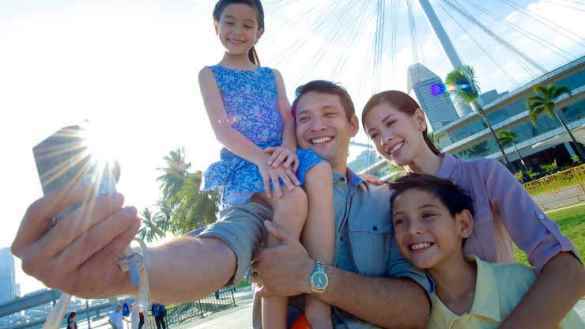 A giant Ferris wheel known as a an observation wheel, the Singapore Flyer is an Asian answer to London’s Eye and inspiration to Jiangxi in China and Las Vegas in the US. 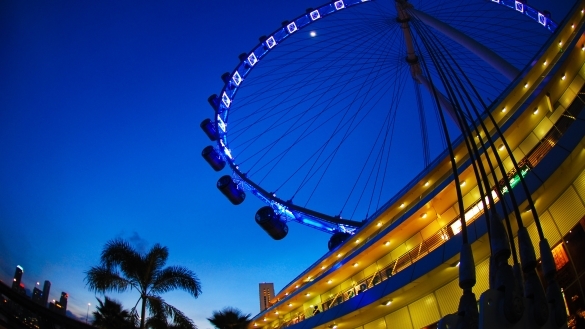 Conceived in 2002 and opened in 2008, the Singapore Flyer, was the world’s tallest wheel until 2014. 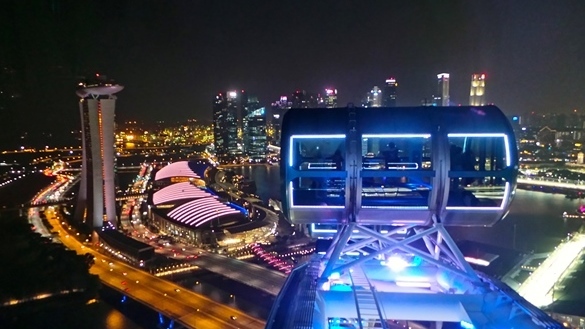 The flyer has 28 capsules mounted outboard of the rim of the wheel structure to provide uninterrupted panoramic views of the city to 28 people in each capsule. The concept of 28*28 is based on thought of Chinese culture, which considers it as an auspicious number for growth and prosperity. Despite having competition from the US and China, this 165 meter flying wheel continues to serve up a gob-smacking panorama. 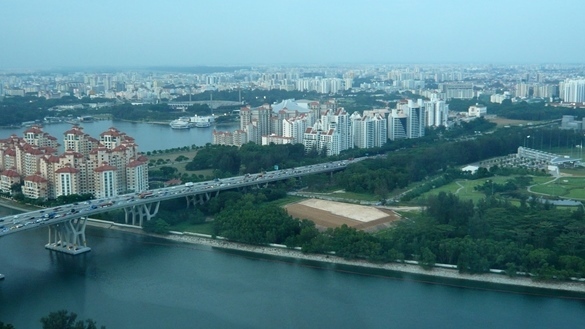 The 32-minute ride will have you peering out over the Colonial District, CBD and Marina Bay, the high-rise housing sprawl to the east, ship-clogged South China Sea as well as Indonesian Spice Islands and the Straits of Johor. Be enveloped safely in a capsule for a fascinating visual 360 degree feast of iconic and historical landmarks such as Singapore River, Raffles Place, Merlion Park, and Empress Place. Be greeted by waves of the ocean that have been bringing the prosperity to the city. There is no other place in Singapore that offers these breathtaking, magnificent day and glittering night views of the entire city in the span of nearly half and hour treat. Right in the center of the vestibule is a lush, tropical rainforest, the Singapore Flyer gets you close to the cascading water displays, streams, rocky outcrops and pond fuse together naturally to offer a picturesque landscape. No matter who you are, where you’ve been and where you’re headed, Singapore Flyer offers you a moving experience at every turn. 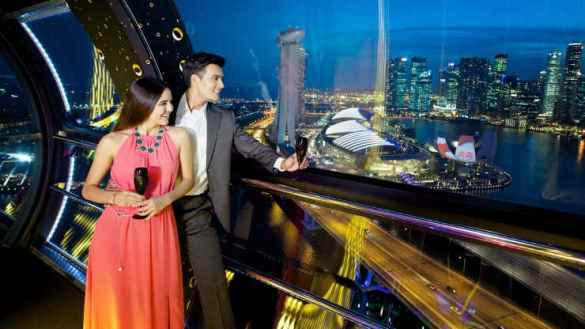 Located in the heart of the downtown Marina Bay, the Singapore Flyer takes a scenic spin – as high as 42 storeys – for you to marvel at the spectacular scenery all round your lively existence. The 30-minute of stunning journey becomes even more mesmerizing with 5 different flight experience. 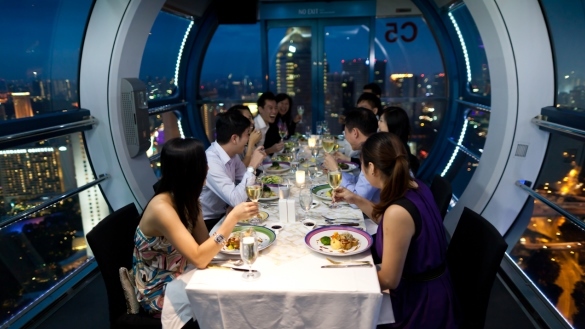 High on the thrills, the Singapore Flyer offers something very unique you can talk about for the rest of your life with offering World’s First and only full butler sky dining experience. 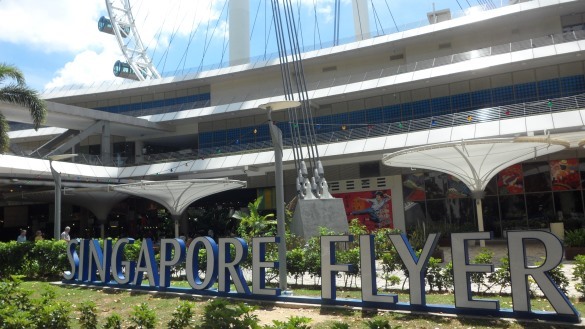 Through special packages, the Singapore Flyer offers high tea, cocktails, Champagne and Singapore Sling on board. It also offers a myriad of entertaining experiences such as a flight simulator and a fish spa. Do you really want us to tell you that you should not miss this incomparable experience of “leaving the world behind” nature. Get the direct entry into the wheel through e-tickets at a discounted rate and literally fly high up to the stars.